Move beyond talking about racism to strengthening your capacity to work for substantive change. Making Sense of Racism explains how people are conditioned to participate in racism. It assists the reader in recognizing racism and interacting more effectively with people who don’t. 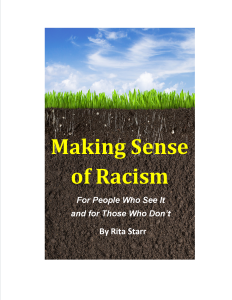 Making Sense of Racism can be ordered in paperback on this website or in a Kindle format from Amazon.com. Her newest book, Spiritual Principles for Overcoming Racism, will be available June, 2019. Discounts are available for twenty or more books.